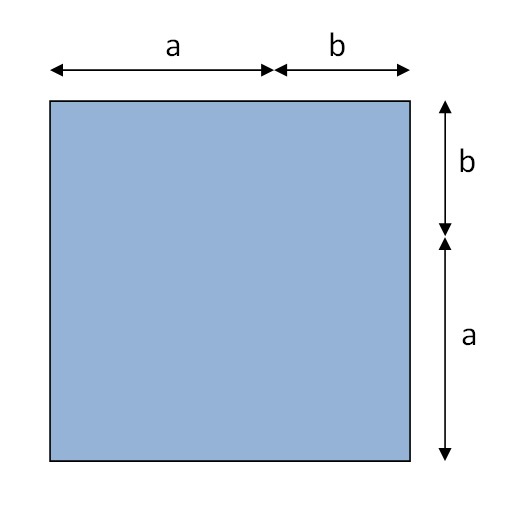 Suppose we start with a square with side x and remove a smaller square with side y. 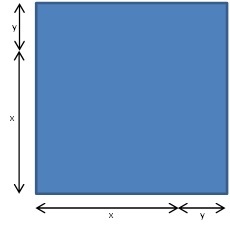 The remaining area (shown in blue) is literally “the difference of two squares”. But we can also find the area another way. Let’s cut things up and move them around. The math we teach should either be useful or interesting. 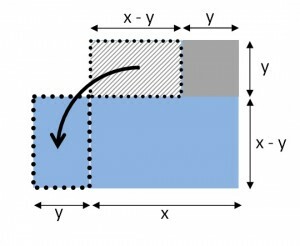 To me, the difference of two squares is more interesting when we use pictures. And the idea of carving up the same area two different ways to see what you learn can be very powerful and lead to unquestionably important results. More about this in the next post. And then you group the common terms to discover the rule for the cube of a binomial. Let me just say that you have a rare appreciation for algebra if that equation by itself stirs you. And I would not be shocked to find that you skipped over the algebra that led to it. But once again, it’s better with pictures. But the volume of the collection has to add up to the volume of the big cube we started with. That means: (x + y)3 = x3 + 3x2y + 3xy2 + y3 ! 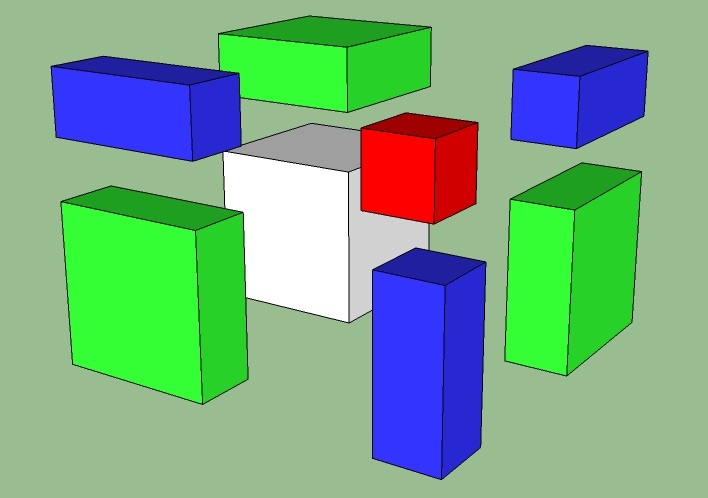 Even though I can’t picture a 4-dimensional cube, I think I know what happens when you break it into pieces: you get 1 big hypercube, 1 smaller hyper cube and a variety of hyper-rectangular solids. 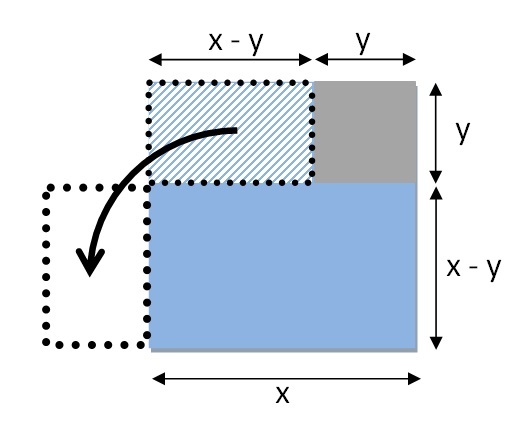 You can predict the dimensions and the number of each type from the equation above. So I guess this time, it’s better with equations. Why do some powers have special names? The expression “ 35 ” means “multiply 3 by itself 5 times”: 35=3×3×3×3×3. I’m not really worried about how to calculate this right now. I just want to agree that we call it “three to the fifth”. And raising to the fifth power doesn’t have any other special name. And when we talk about x7 , we say “x to the seventh”. Again, no special name. But there are two powers that have additional names. When we talk about say, 52, we most often call it “5 squared”. 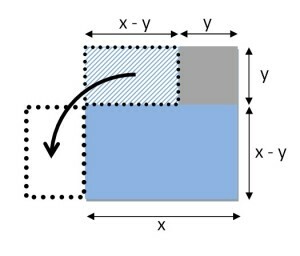 Raising to the second power is called “squaring”. Raising to the third power is called “cubing”. And , of course, you knew that. But it is easy to overlook why these (and only these) powers have these additional names. The additional names have geometric meaning. 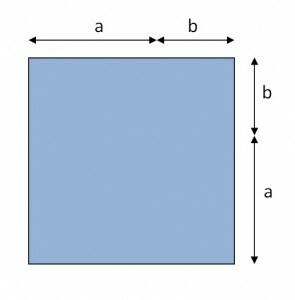 When you raise a number to the second power, you are calculating the area of the square with a side of that length. So we call it “squaring”. 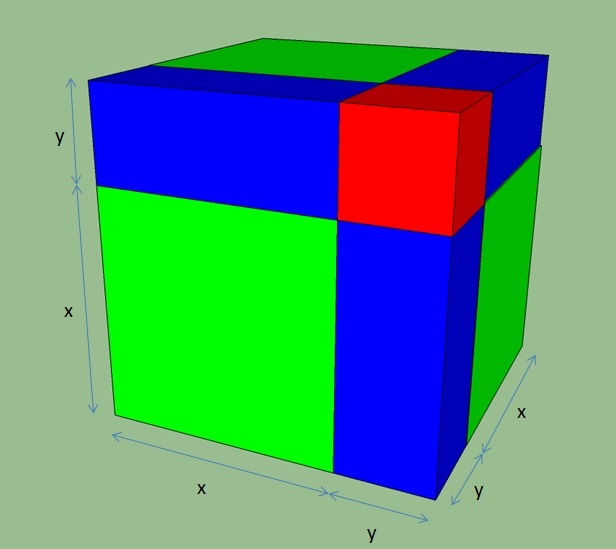 When you raise a number to the third power, you are calculating the volume of the cube with an edge of that length. So we call it “cubing”. If we lived in 4 spatial dimensions, I bet we would have a name for raising things to the fourth power as well. 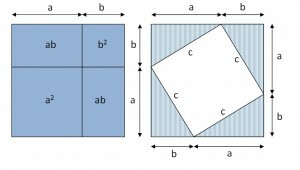 It is easy to overlook the geometric meanings of squaring and cubing. I know this because of how my students respond when we talk about FOIL-ing to square a binomial. The geometric meaning always seems to catch them by surprise. But it is usually a happy discovery. For those of you who haven’t seen it in a while, I’ll review. FOIL is a mnemonic device used to help students remember how to multiply binomials. It is the result of distributing multiplication over addition multiple times. You can use it to square binomials. Before we combine the middle two terms, note that there are 4 pairings. That’s where the mnemonic FOIL comes in. You get the pairs by multiplying the FIRST terms, the OUTER terms, the INNER terms and the LAST terms. I don’t have a problem with this mnemonic itself. It’s kind of robotic, but I understand that you have to make certain processes automatic so that you can get to the next step. 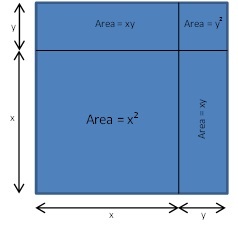 I wouldn’t want my students to have to go back to the distribution property every time they see (x + y)2. In fact, I don’t want them to have to foil it either. I want them to know that (x + y)2 = x2 + 2xy + y2 not because they have memorized it but rather because they can picture it! 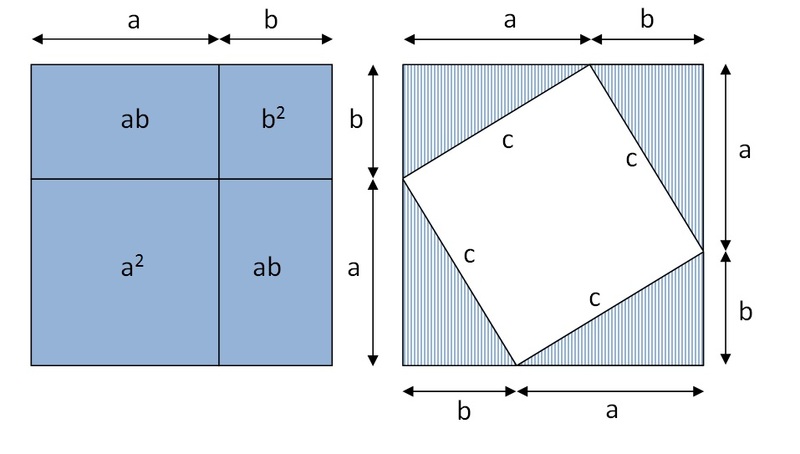 We call it “squaring” because it gives us the area of the square. 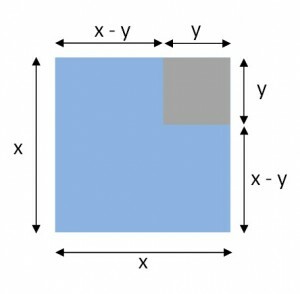 So (x + y)2 is the area of the square with length (x + y). Now, let’s draw some pictures. 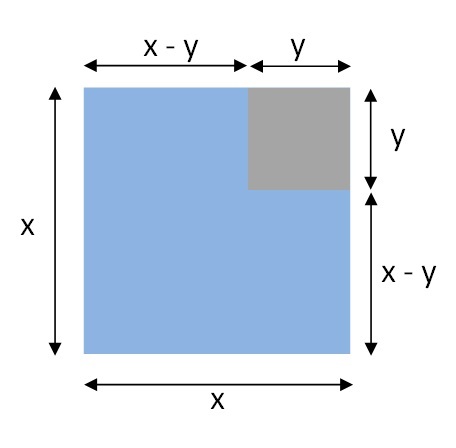 The area of that square is certainly (x + y)2. But what if we break that square into smaller regions? But it’s better with pictures. 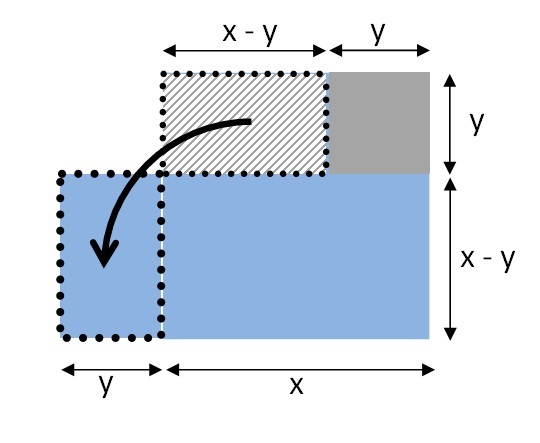 Next post — higher dimensions. And then x2 – y2. Spoiler: it really is the difference of two squares. My name is Philip Keller. I teach physics at Holmdel High School in New Jersey. My students are fine young men and women who patiently indulge (and even encourage) my occasional digressions on to topics that, while physics-related, are not officially in our curriculum. When I can, I like to show them other ways of looking at the math they already know. Or show them the math that they should have known before taking on the challenge of learning physics. Some of these topics are gathered and organized in a book that I hope to release this summer. 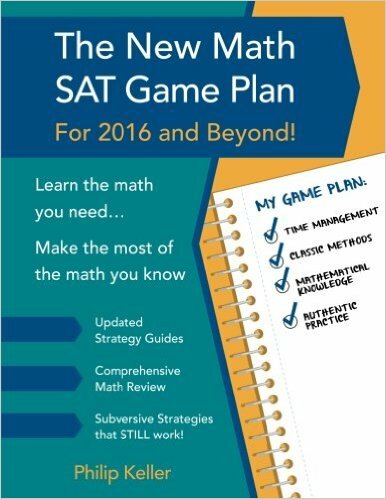 Advanced Math for Young Students: A First Course in Algebra is designed for middle school students to give them a head start in thinking algebraically and using algebra to solve puzzles and to express relationships. That’s what we do in physics all the time. Working on this project has led me to ponder other mathematical questions that are more suitable for high school students and teachers to ponder. I would like to use this blog to explore some of them as well. Expect a mixture of math, physics and some ideas about how we teach them. I am new to blogging in general and to WordPress in particular. As I learn its features, expect format changes and all kinds of plug-ins and gizmos. I expect to eventually settle down to a consistent look, but for now there are so many new toys to play with.